NOTE: The Black Devil engine is not manufactured anymore. It was replaced by a more modern and better performing engine . The Electric start version of the Cors-Air M21Y was released on the market over more than sixteen years ago and has proven to be one of the very best, reliable and user friendly engine in the PPG industry. 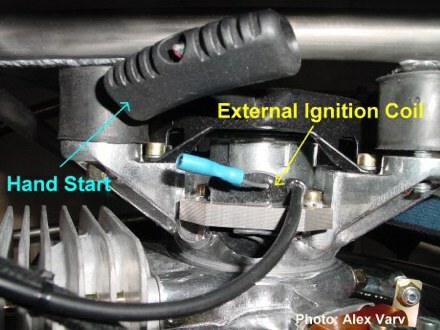 This engine was produced with the electric start option only. 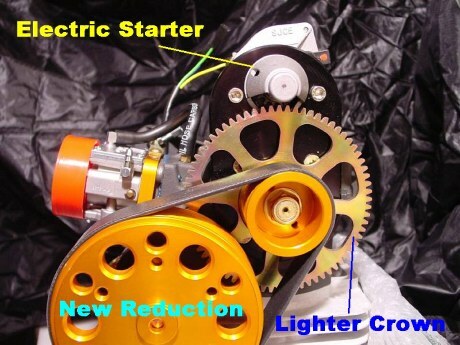 As a response to a wider range of requirements and well aware of the electric start over pull start debate among pilots, this year, JPX Italia released a new and light weight version of the Cors-Air engine with pull start. This was a bold step in a new direction. 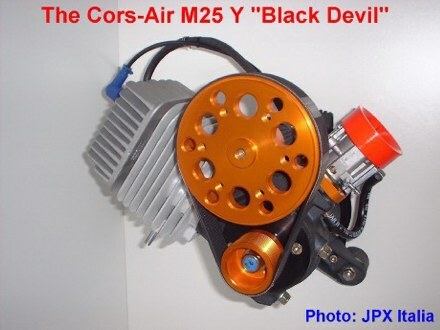 A new engine was born: The Cors-Air M25Y -Black Devil. The Black Devil exhibits the same power, reliability, safety and low maintenance like its predecessor. Just like the electric start version (Cors-Air M21Y) the Black Devil will have no broken muffles like other brands of engines. 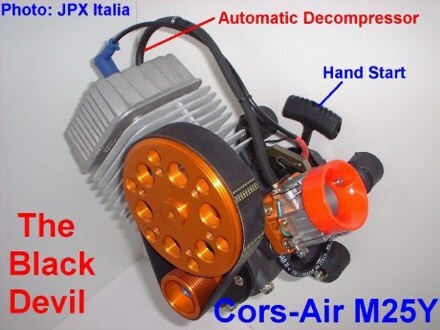 The slogan that JPX Italia uses for this engine is:" It's small like a 50 cc, it weighs like an 80 cc, but it pushes like a 200 cc engine and has the legendary reliability of the M21Y"
Last November, I had the opportunity to test fly the Black Devil during my visit at the Cors-Air factory in Cavriago (Italy) and I must admit that this engine surpassed my expectations. Smaller and lighter but as powerful as its predecessor, the engine runs incredibly smoothly and it is very easy to start due to a hefty external vacuum operated automatic decompressor. 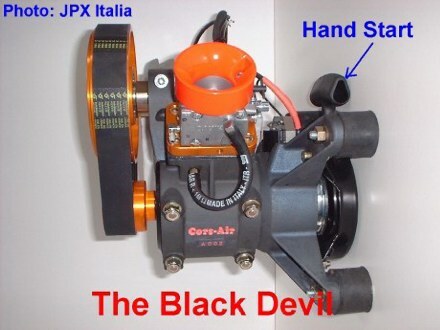 The Black Devil has the same safety margin as the Cors-Air M21Y. The Black Devil was presented at the Parastar Convention (April 8-11 2004) at Fantasy of Flight (Florida) and at Sun and Fun (April 13-19 2004) in Lakeland Florida. Aerocorsair USA presented the engine itself on its stand, next to Ohio Powered Paragliding where a new generation of AIRFER Paramotors with the Black Devil were also presented. The Black Devil was very well received by the community and many pilots had the opportunity to test fly it. Mounted on a Titanium frame AIRFER Tornado paramotor with a 110 cm propeller and a weight of 54 Lb, the Black Devil pushed a prompt 135 Lb of thrust. Mounted on an AIRFER Bimax with a 48 inch propeller, the Black Devil is a true tandem machine. It has the best "power to weight" paramotor on the market so far. Below, we publish a few pictures of the Black Devil and this page will be updated again very often. In the pictures to come, we will present the Black Devil mounted on a paramotor, ready to fly. 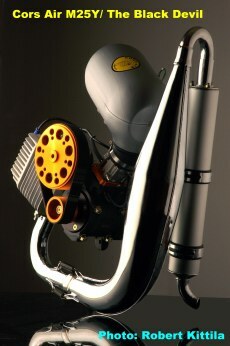 The Black Devil, just as the Cors-Air M21Y and like no other engine used in paramotoring has the cylinder tilted to one side. This ensures that the engine is very hard to flood because the excess of fuel is easier expelled into the exhaust manifold. No other engine on the market has this feature. Also, the tilted cylinder off-sets the weight distribution and partially eliminates the torque generated by the engine and propeller. The Black Devil is easy to repair. 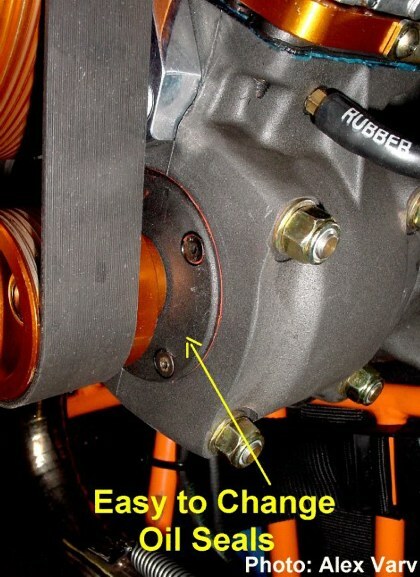 There are no bearings pressed into the crankcase like on all other engines because the crankcase is split in half. The Black Devil was designed to fit on virtually any existent frame on the market thus most paramotors can be retrofitted with this engine. This makes the Black Devil a real universal engine. 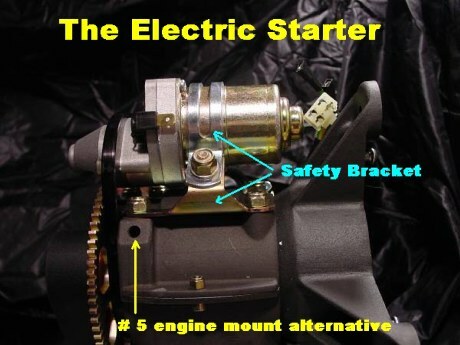 The electric starter has a factoty installed additional safety bracket. 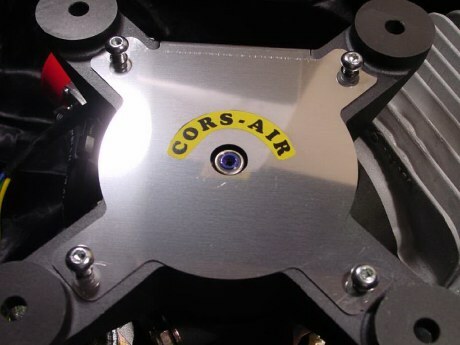 Compared to the older version (Cors-Air M21Y) the Cors-Air M25Y Black Devil engine in its electric start version has a miniature electronic ignition and battery chargins system. 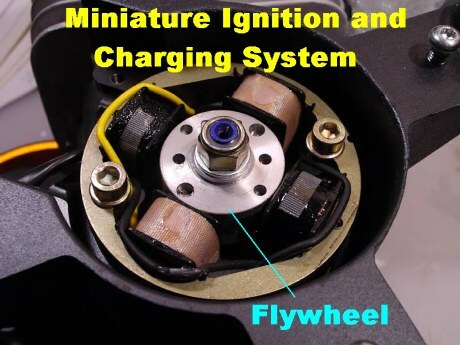 The heavy fllywheel used on the M21Y engine was replaced with a miniature one and it is very well balanced. This also made the Black devil lighter. The well known Walbro WB 37C carburetor allows the Black Devil in both versions (electric and hand start) to fire very easily. The hand start version will usually fire after the third revolution. 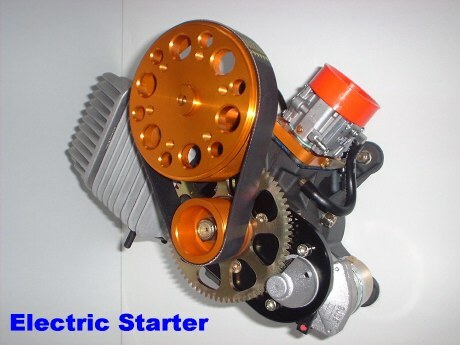 The electric start version, will fire in less than one second warm or cold. This feature is already well apppreciated in the flying community and more and more manufacturers use the Black Devil on their machines. Other important features of this engine are: it is very reliable, user friendly and strong. The exhaust system (tuned pipe and muffler) NEVER fails or breaks!! 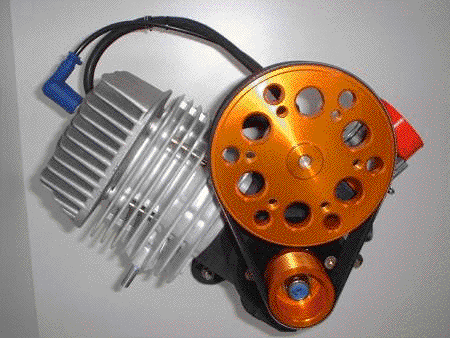 Below we show the engine mounting system. 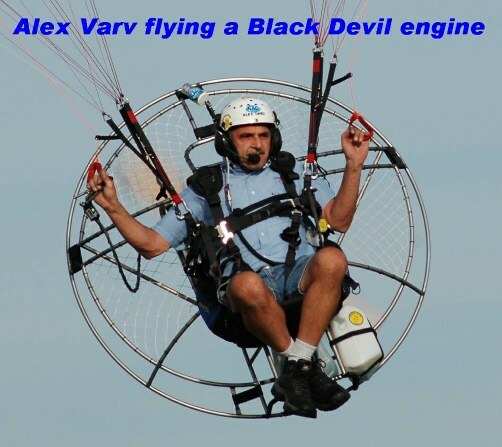 Because of the four engine mounts, The Black Devil can retrofit virtually ANY paramotor on the market!!! 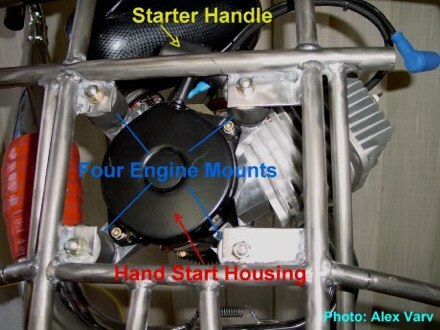 The hand start has a very strong and original construction, has NO plastic parts like some other engines and it works impeccably even in the coldest temperatures. The hand start on the Black Devil (Cors-Air M25Y) was designed in such a way that a perfect custom fit of the handle on the frame is possible. This was achieved by AIRFER Paramotores on their Titanium frames by using a quick release pin that can be moved up or down to ergonomically fit each pilot. The same fieature is used with success on the new "Paralite Sky Cruiser" machines, "Paracruiser" and soon to be released "Paratoy models". 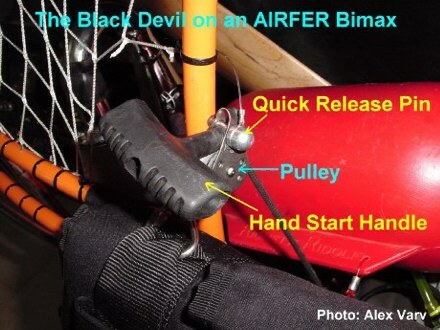 Soon, Fly Products will also use the Black Devil on their paramotors. 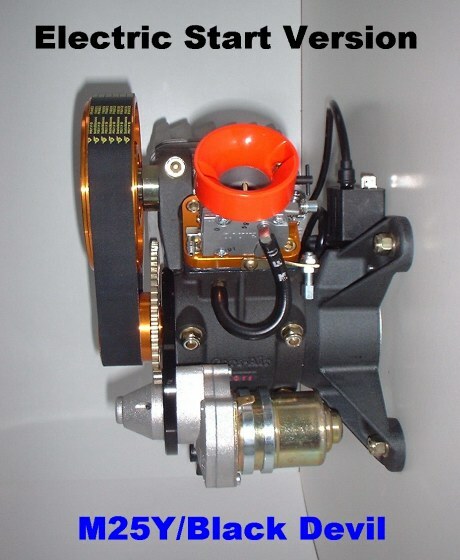 The original automatic vacuum operated external decompressor present only on the hand start version, allows a lighter pull to start the engine. The Black Devil is NOT painted. It is anodized and basically can be produced in different colors. The picture presents prototype # 004 anodized in black. It is well wroth knowing that the anodized surface is very tough, chemically resistant and lasts a lifetime. Like any Cors-Air, The Black Devil is very easy to repair. There are NO bearings pressed into the crankcase and after removing the external hardware, only four nuts need to be removed in order to split the crankcase! Like no other PPG engine available on the market today, The Black Devil can have the oil seals changed WITHOUT opening the crankcase!! This operation requires only the removal of the small reduction pulley and of the round cover plate held in place by four bolts!! With a distance between the engine rubber mounts of 5 and 1/2 inches, the Black Devil can be easily adapted to almost any paramotor on the market! 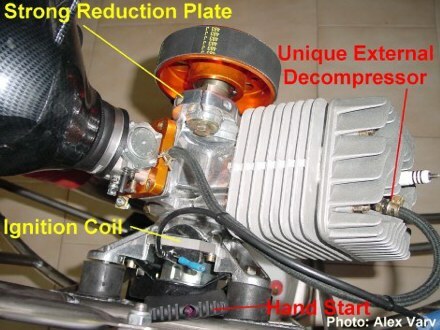 Other measuremnet of the engine are: "depth" of engine from the rubber mount to the external surface of the big reduction pulley is 9 1/2 inches. 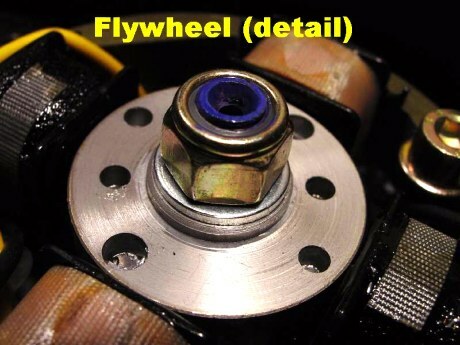 The center of the propeller hub is 1 inch above the level of the upper engine mounts. Note: We received letters from new Black Devil owners who experienced difficulties while assembling the exhaust brakets. 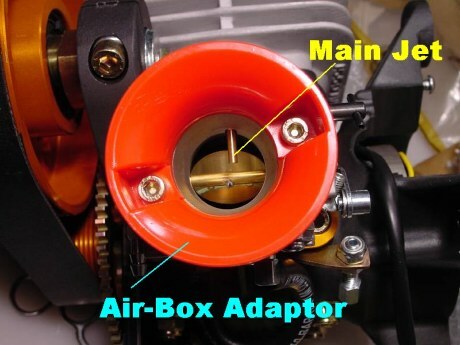 Since JPX Italia mainly produces the engines for Powered Paraglider manufacturers, the Black Devil owner's manual does not explain how to assemble these brackets. 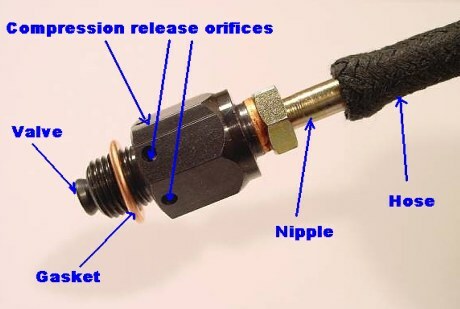 For the individual pilots who purchase the engines from Aerocorsair USA, we consacrated a special page to illustrate this. Please click the following link to see pictures with explanations how to assemble the bracket step by step.